Description: Relax in That Sunlit Cottage with a Sweet Yellow and White Artisanaware Lumbar Pillow. Limited Edition Lumbar Pillow Covers from the Artisanaworks Studio/Workroom in a Washed and Softened Euro Linen in a Sunny Yellow. 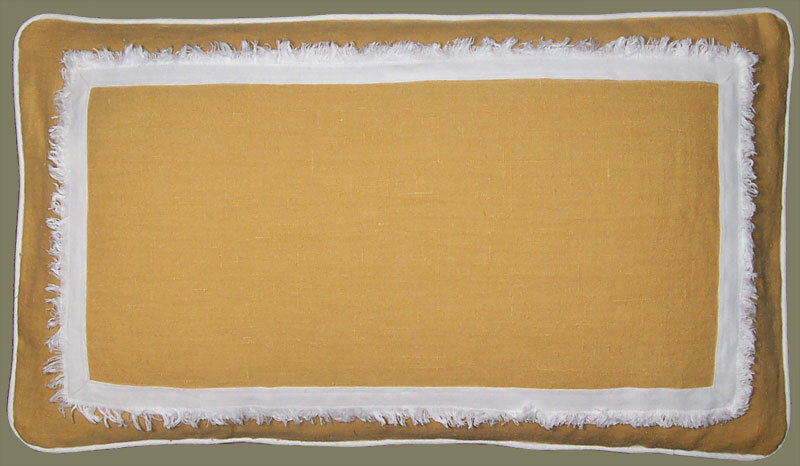 A Rectangular, Inset Band in White Linen/Rayon , Frayed and Fringed, is Appliqued to the Face of these Lumbar Pillow Covers. Welt Detail in White Linen. Play with Print and Pattern Mixing by Combining With the Coordinate Pillow Covers: Yellow and White Floral Hand Print, Border Hand Print, Woven Ticking Stripe, Window Pane Check, and Wavy Lattice Motif Covers.